Tucson, Arizona is my home. It’s not where I’m from, it’s not where I’ve lived the longest, It’s not where I’ll be forever. But it’s where I’ve landed and it’s embraced me wholeheartedly. After close to ten years of living in NYC, moving to the desert was quite a change. My partner and I moved out here so that he could pursue his Ph.D. in clinical psychology at the University of Arizona. I agreed to give the move a shot, thinking the change of pace would be nice. 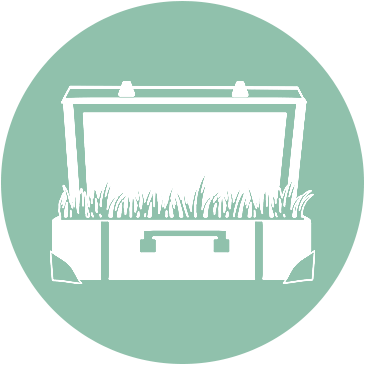 I was also craving time and space to focus on building the Green Suitcase Travel. It’s been four years now and being a resident out here has given me more than I could have imagined. Living here has taught me to connect deeper with the natural world and to understand our role in our in its survival. The desert, after all, is not a friendly climate. Here, every drop of water counts and every plant has ways of defying the norm to survive. While I’ve had a strong interest in sustainability for a while, Tucson has pushed me to really look at how to that plays out in my life. You learn a lot about survival when you live in the desert. Things like learning how to rainwater harvest, are the norm here. This may sound slightly harsh and unappealing. But look past its spiky exterior and the city has a soft underbelly comprised of desert flowers, good people, and a rich history. Not to mention, our captivating painted skies! Catch the most magical skies you’ll ever encounter at sunrise and sunset. When the lights go off, the stars come out to dance and dazzle viewers. Tucson is home to International Dark Skies Association, a 501-C3 organization, that combats light pollution worldwide. Artificial light pollution can have a devastating effect on our eco-systems. Curbing artificial light doesn’t just help the environment, it creates clearer skies for enjoying the stars. The Sonoran desert is also the greenest desert in the world! Basically, this is a great place to explore the natural sciences. A fitting place for a green suitcase, eh? After living in NYC for so long, I thought I couldn’t possibly love another city in the same way. And I don’t. I love Tucson in a very different way. It’s taken me some time to write this destination guide because of how personal it is. If I’m going to share my suitcase of stories with you from around the world, I can’t be selfish. I need to share my home with you. Greetings from Tucon mural close to Fourth Avenue. Photo by Misty Foster. While there are many big resorts out here, the city offers a handful of charming historic and boutique hotels. Everything in town is within a 20-30 minute drive and the main hotels are all conveniently located within city limits. 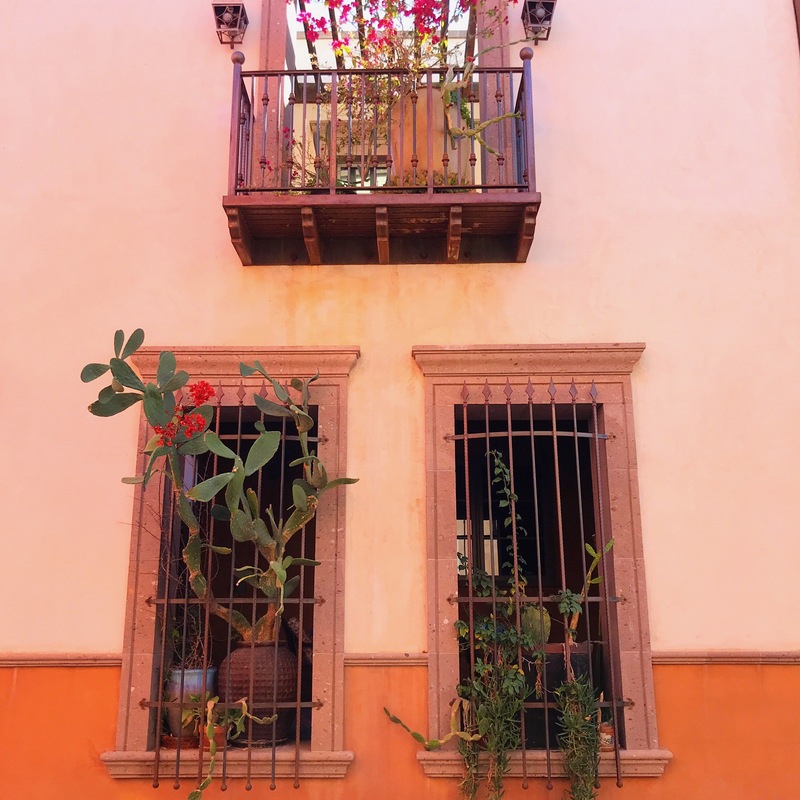 The exterior of Hotel Congress in Tucson. Photo by Misty Foster. Step into the lobby of the Hotel Congress and you are instantly transported back in time to an era of flappers and mobsters. In fact, some mobster activity did go down in this historic landmark! The infamous, John Dillinger and his gang were caught here in 1934. How they got captured is a really fun story that involves firefighters carrying down bags of loot and guns for them, before they realized who they were. The hotel was originally built in 1919 and much of the signature art-deco decor remains intact. Throughout the years, the restorations and additions to the hotel have been helmed by local artists and entrepreneurs. Today, not only can guests stay the night in the hotel, they can dance the night away at Club Congress or enjoy a delicious meal at the Cup Cafe. The retreat room at Miraval. Photo courtesy of Miraval resorts. Nestled in the Catalina foothills, Miraval is one of the top wellness destinations in Arizona. The 400-acre resort boasts an impressive spa, culinary, and cultural offerings for guests. Their ethos is that when life is in balance, you are at your best. 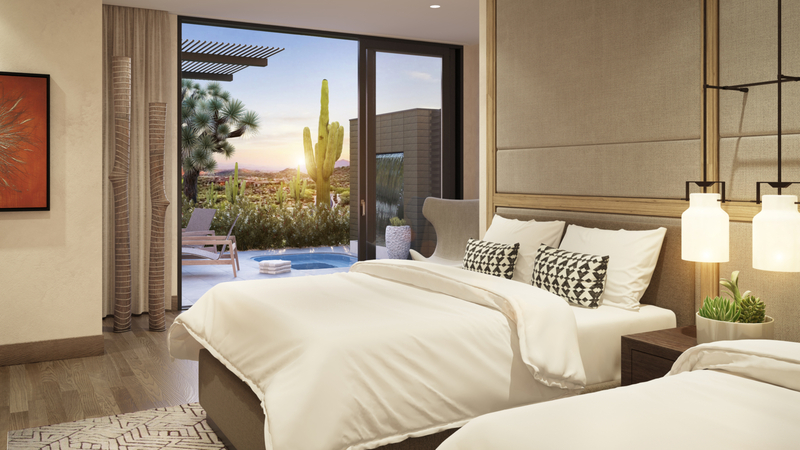 The team at Miraval feels that the Sonoran desert is the ideal place to rejuvenate because of the ample sunshine and warm climate. Folks into mindfulness and other integrative wellness therapies will find plenty of opportunities to delve into the self. We love them for their integration of Native American rituals and principals, and the way they honor and incorporate nature into the experience. They also work with local farmers to craft organic, seasonally based dishes that are innovative and nourishing. 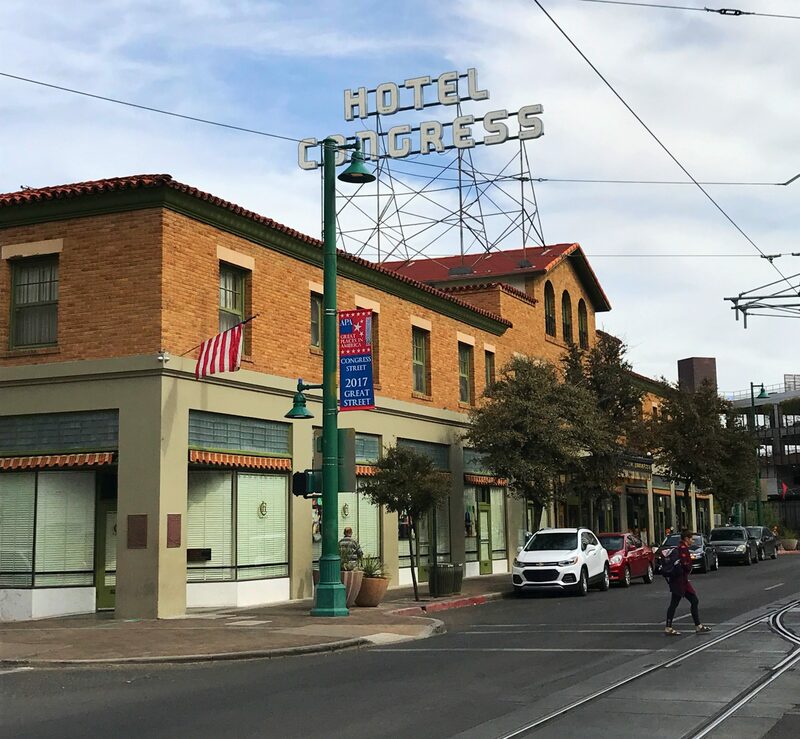 Tucson’s AC Marriott location opened in 2017 and is in the heart of downtown. Moxy, the corporation’s boutique line of hotels, is set to open in 2019 close to the convention center. 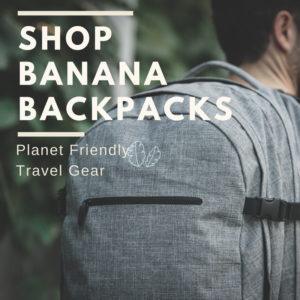 While we are more inclined to stay somewhere locally owned and run, Marriott does have decent sustainability and social responsibility programs. When your stomping grounds are the Sonoran desert, you really get to put on your explorer hat and enjoy the great outdoors. Tucson draws in birders, snowbirds, hiking enthusiasts, and star-gazers alike. You’re probably thinking, “but isn’t it scorching hot out there?” Yes, yes, during the summer it’s true but the majority of the year, the city experiences temps in the 70’s and 80’s. Ah, and it’s a dry heat! Those who bravely visit during the summer months will be treated to Tucson’s monsoon season, which is a magical experience. The view of the valley from the hike down Mt. Lemmon. Photo by Misty Foster. Ski, hike, bike, or run! There are many ways to actively explore Mt. Lemmon. 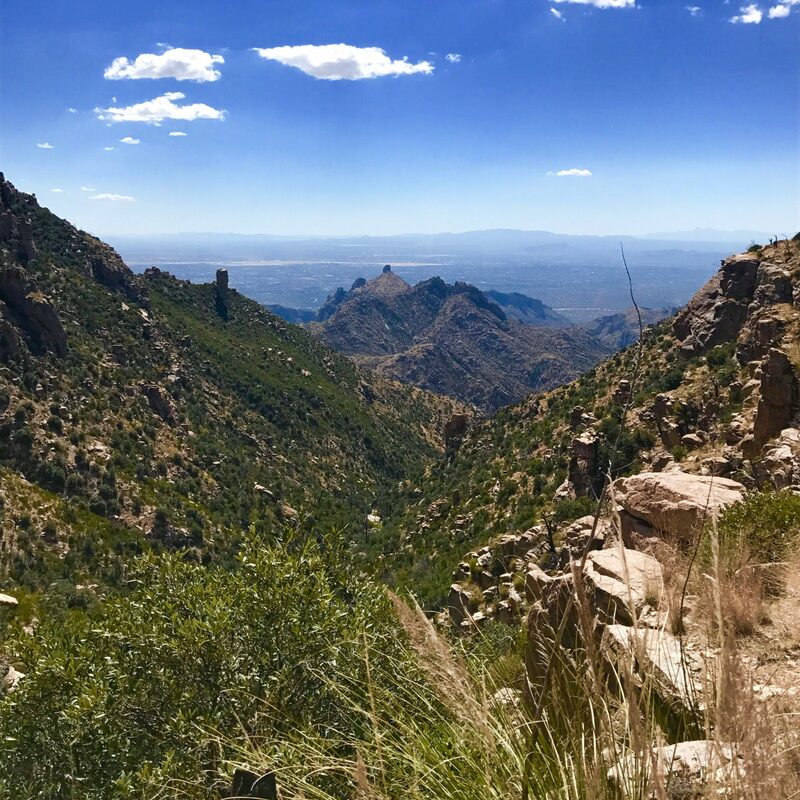 Named after botanist Sarah Plummer Lemmon, Mount Lemmon fittingly has a ton of vegetation. 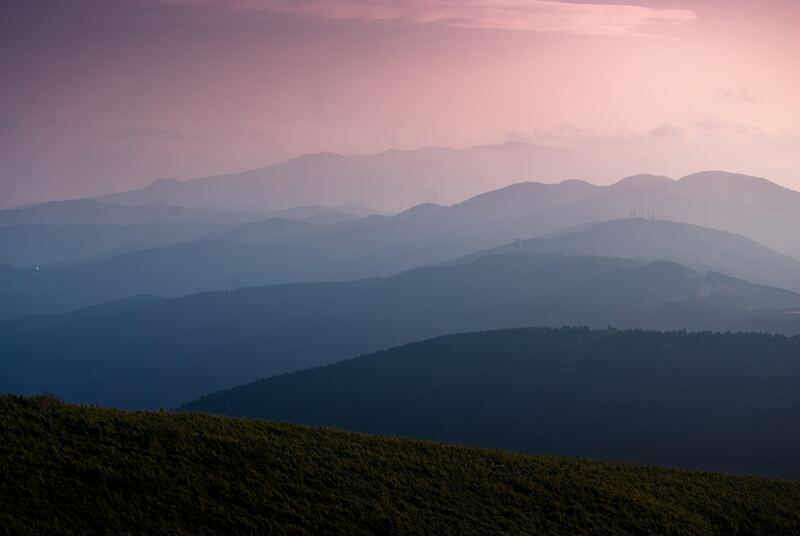 In fact, the mountain contains the same amount of biodiversity from the summit to the base, that the drive from Mexico to Canada has! When you aren’t skiing or grabbing grub at the Iron Door on Mount Lemmon’s Ski Valley, head over to the Sky Center to catch the stars. The observatory boasts having the “largest dedicated public telescopes in the west!” according to their site. Pro tip: The butterfly trail and the Mount Lemmon to Sabino Canyon throughway are great hiking options. The latter also happens to be part of the Arizona Trail. The Mercado is Tucson’s only public marketplace. The charming old-world courtyard is a great place for gathering with loved ones or to cozy up with a good book. Grab a coffee from Presta, a treat from La Estrella, and let yourself escape in inviting atmosphere of the Mercado. There are many cultural events held here throughout the year, as well as a weekly farmers and flea market. The Biosphere 2 at sunset in Oro Valley. Photo courtesy of the Biosphere 2. You may remember the Biosphere 2 from it’s highly publicized experiment in the 1990’s. 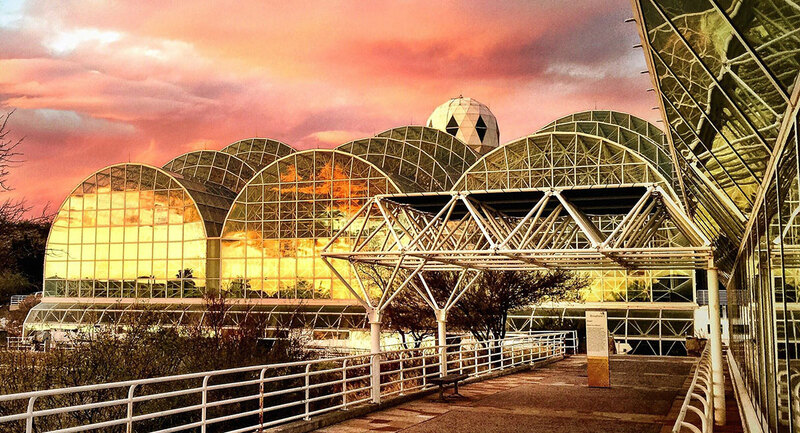 A group of scientist sealed themselves in the Biosphere to see what it would take to produce their own food, oxygen, and more. Though the experiment was considered a failure because the scientist ultimately were not able to sustain themselves, it did help further our understanding of survivability on our planet and beyond. Today, the active research facility is open to the public for tours. It’s a truly unique place for exploring our Earth’s model systems, under one roof. We are including this one in our guide because of the Pink Floyd laser light show. Yes, you read that correctly. On Saturday’s at 9:00 pm, the Flandrau Planetarium puts on an epic light show set to the Dark Side of the Moon. They show cool star show’s the rest of the week but you gotta love that they do this. Part open-air museum, part zoo, part botanical garden, the Arizona-Sonoran Desert Museum has something for everyone. It’s rated one of the top ten museums in the country on Trip Advisor and the number one activity in Tucson. The museum hosts live demonstrations with some of our most misunderstood desert dwellers and even has an aquarium with the Sonoran desert’s coastal creatures. It’s a great place for families and amateur earth scientists! Make sure to stop by and see the Javelinas! It’s the only time you’d actually want to encounter these guys in the desert. The White Dove of the Desert, as it’s affectionately known, the Mission San Xavier del Bac is the oldest in-tact European structure in Arizona. Dating back to the 1700’s is a significant landmark in the area. The man who many consider the father of Tucson, Father Kino, started the construction on the church and played a key role in the mission’s history. We even have a whiskey (read: the best damn whiskey) named after the mission. The food scene here is NOM NOM NOM-AZING. 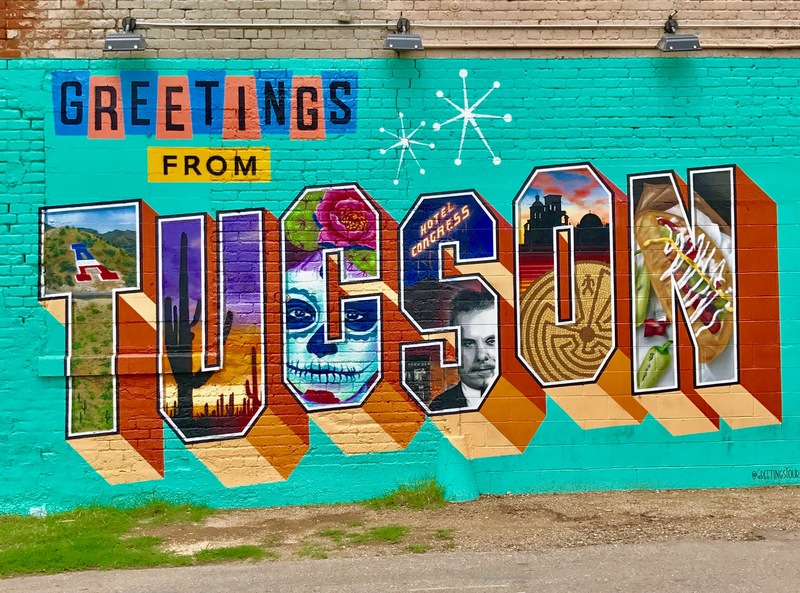 Being located so close to the border certainly means you’ll find delicious Mexican food in town, but Tucson has more going on than one might realize. The city was the first to be designated a UNESCO City of Gastronomy in the United States. Ties to Native food heritage here are strong, just visit the Mission Gardens or Native Seeds/ SEARCH to see for yourself. 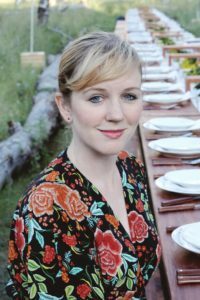 Tucson’s food stardom was recognized by the New York Times in 2016 and TV personalities, Alton Brown and Guy Fieri have covered the destination. To top it all off, one of our food “staples,” the Sonoran Dog, recently won a James Beard award. 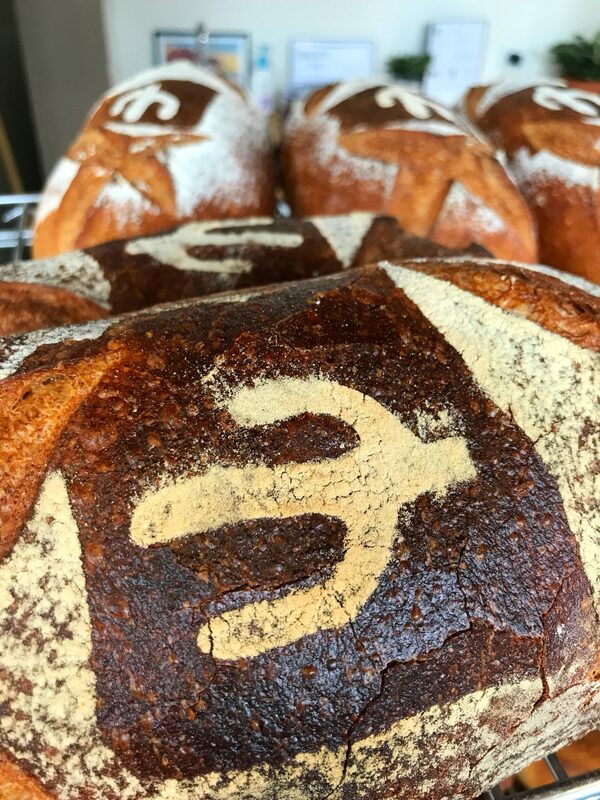 A delicious loaf from Barrio Bread. Photo by Misty Foster. We dare you to ignore the intoxicating smell that wafts from Barrio Bread’s bakery. Owner Don Guerra, a titan in the slow-fermentation movement, works solely with local organizations to make delicious creations. Each day a different type of bread is made in small-batches. Our favorite: the Rustic Olive loaf! 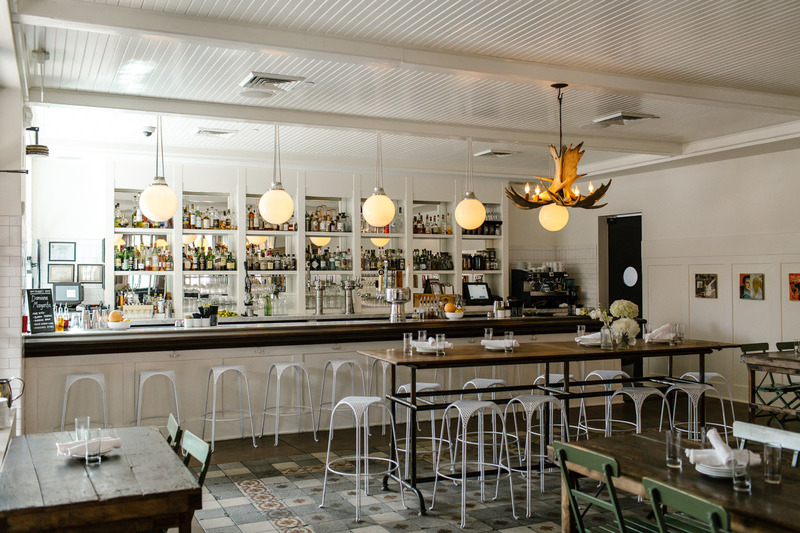 The interior bar of Agustin Kitchen. Photo courtesy of Agustin Kitchen. Located in the Mercado San Agustin is Agustin Kitchen. The farm-to-table restaurant proudly serves 100% sustainably sourced proteins. The seasonally based menu often features ingredients from local vendors. The modern decor and warm atmosphere make it an inviting spot for a hand-crafted cocktail…or two. Though the organic, gluten-free restaurant does cater to the vegan diet, you don’t have to be vegan to love Tumerico. The scratch-made menu changes daily and the ingredients are fresh and locally sourced. Chef Wendy Garcia grew up on an organic farm in Hermosillo, Mexico and is passionate about bringing tasty vegan food to the community. Want more ideas? Tucson has an amazing online recourse called, Tucson Foodie. Check it out, but be careful if you’re hungry. All Souls Procession– Tucson has the largest All Souls (Dia de los Muertos) parade outside of Mexico. It’s one of the city’s most treasured cultural events. Gem & Mineral Show– The largest and most prestigious gem and mineral trade show in the world takes place in Tucson every year. For four weekends in January/ February, the city transforms into a global hub. People come from all over the world to buy, sell, and browse. Looking at rocks might not sound so interesting but there’s more to it than that. There are seminars, parties, a music festival, gala, and more that accompany the event. 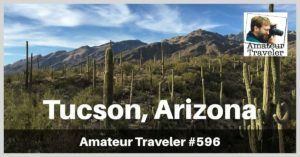 Listen to GST’s podcast on Tucson as a guest on The Amateur Traveler. 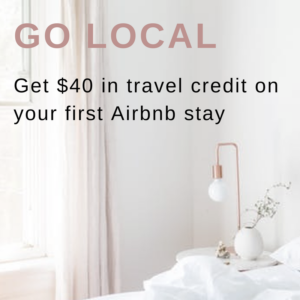 Ready to go visit Tucson? 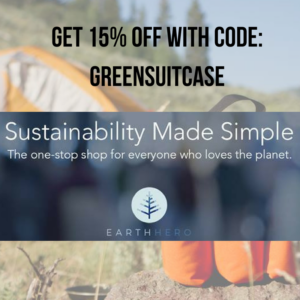 Get started with Green Suitcase Travel.